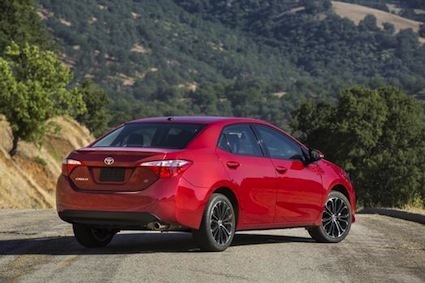 The 2014 Toyota Corolla has been introduced, the latest iteration of the world’s best-selling model. The five-passenger front-wheel drive Corolla is now entering its 11th generation and will appear in Toyota showrooms this fall. Introduced in 1966 in Japan, the Corolla showed up in the United States two years later and is now sold in 154 countries. Nearly 40 million Corollas have been built with Toyota going full throttle with its newest edition. The 11th generation Toyota Corolla. The all-new Toyota Corolla takes its styling cues from the Corolla Furia Concept unveiled earlier this year at the North American International Auto Show in Detroit. That concept later appeared at auto shows in Washington, DC, Chicago and New York, offering a strong hint at the direction the new model would take. 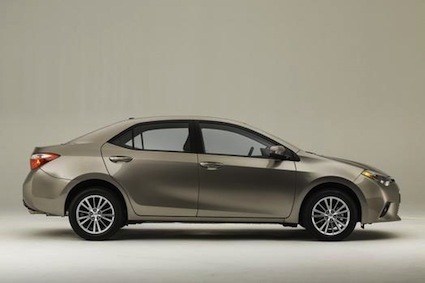 For 2014, Toyota serves up a compact sedan that offers more personality, one with chiseled lines, tapered front and rear ends, and stronger wheel arches. The new model is slightly longer and wider than the 2013 edition, and stands closer to the ground. LED headlamps and daytime running lamps are standard. Design themes introduced in recent years in the Camry and Avalon sedans are apparent including the LED lamp assemblies and beltline embellishments. That effort produces a uniformity in Toyota’s small, medium and large sedans that not every manufacturer grasps. It represents a well thought out company initiative to help buyers move up the Toyota brand chain with ease. Four trim levels will be available: L, LE, S and LE Eco. 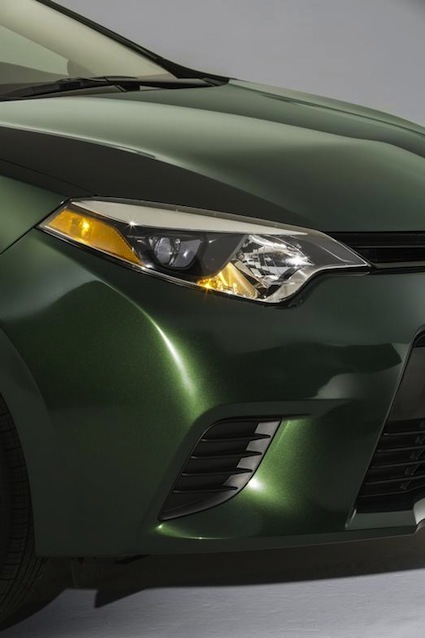 LED headlamps with LED daytime running lights are standard across the model line as are color-keyed door handles and side mirrors, power door locks with an automatic locking feature, power windows, air conditioning, Bluetooth connectivity and a 60/40 split-folding rear seat. The Toyota Corolla comes equipped with eight standard airbags. 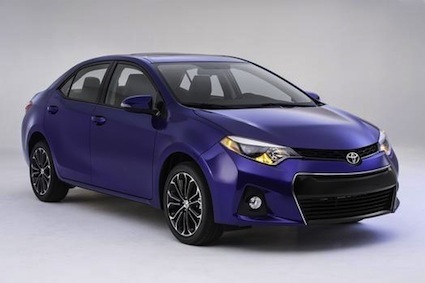 The cabin may surprise current Corolla owners as Toyota sought to make it roomier, quieter and more elegant. 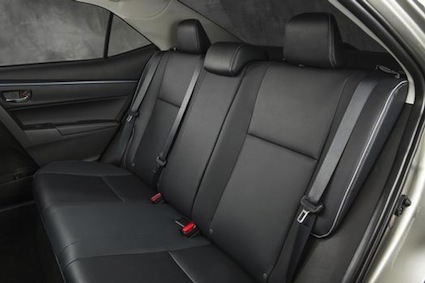 The extra room is most noticeable in the back seat where legroom has been increased. Hip room has also been enlarged and with greater use of urethane, seating surfaces are softer, yet supportive. Noise levels have been managed by making use of an acoustic glass windshield, better carpet insulation, an inner dash insulator and a fender sound insulator. Corolla Furia Concept styling cues are evident. Under the hood, a 1.8-liter four cylinder engine makes 132 horsepower at 6,000 rpm and 128 foot-pounds of torque at 4,400 rpm. An enhanced version of this engine is also available and has been equipped with upgraded variable valve technology to deliver 140 horsepower at 6,100 rpm and 126 foot-pounds of torque at 4,000 rpm. Surprisingly, Toyota is still offering a four-speed automatic with its base Corolla L model or a six-speed manual transmission. The industry standard has been moving to six-speed automatic transmissions. 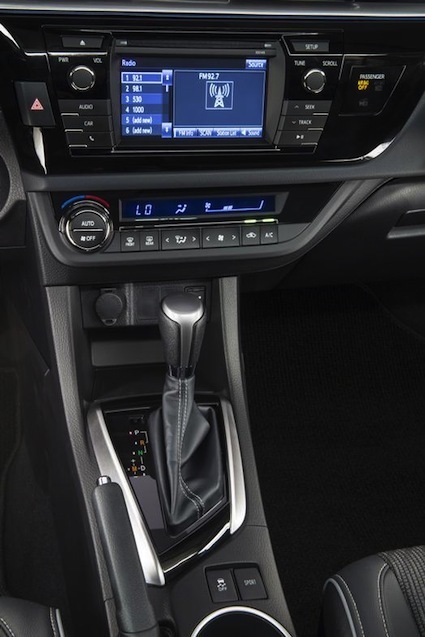 However, from the Corolla S on up, a continuously variable transmission is available, what should help its most efficient model top 40 mpg on the highway. Corolla is now closer in appearance to Camry and Avalon. The Toyota Corolla has always represented value and it is that attribute along with quality and reliability that keeps customers returning generation after generation. The 11th generation model is no slouch when it comes to offering numerous amenities as part of its standard and available equipment packages. For 2014, available smart key with push button start, touchscreen audio, apps integration, a power moonroof, available paddle shivers and a rear deck lid spoiler can be had. Pricing, option packages and additional content information will be made available closer to its release date.